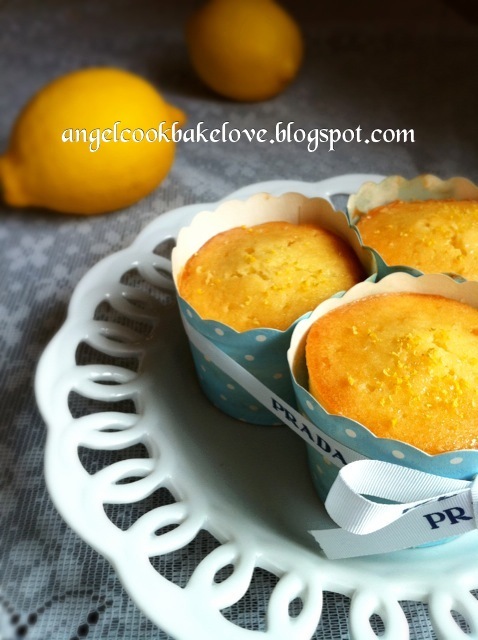 You will love this cake if you are a lemon lover. This cupcake is extremely easy to make as all-in method is used, i.e you only need to prepare the ingredients and whisk them together well, just need to follow the beating time strictly. Result may vary due to under or over beating. In case you think that the cake will be hard as there is no prior creaming of butter, this cake is actually soft and fluffy (of course the softness here is based on pound cake standard). You do not need more than 10 minutes to prepare this cake but you need patience to let it slowly mature over the next 24 hours (at least). However, if you decide to taste it immediately (like what I did) the cake still tastes good though it may be a bit crumbly (the cake will become moister after the fat in butter releases over time). If you are not lemon lover you may find the lemon in the cake overwhelming like what my parents thought. 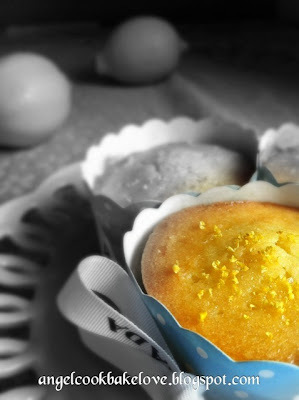 They loved this Lemon Yogurt Butter Cake which was made in the same manner but they did not like this lemon cupcake. On another note, you can always make it less “lemonty” by reducing the lemon zest and lemon juice used in the recipe. *Cook over low heat till sugar dissolved. 1) Preheat the oven to 180°C. Lightly grease a 12-hole muffin tray or line with paper liners/muffin cups. 2) Add all ingredients (sift in self-raising flour together with baking powder) into a large bowl and beat with an electric mixer for 2 minutes, scrape down the bowl in between (start from low speed to blend in the flour first so that the flour won’t fly around then change to medium speed). 3) Spoon batter into prepared muffin cups equally (I used an ice-cream scoop) and bake at middle rack for about 20-25 minutes until a toothpick inserted and comes out clean. 4) Once done, prick the cake top with a skewer or toothpick. Pour over lemon glaze to hot cake (see note 3), cool on wire rack. Cake is best served on second or third day. Cake can be kept in airtight container in room temperature for up to 4 days. 1) Soften or not to soften beforehand? The butter I used softened quite fast in room temperature so I just took it out at the beginning of preparation, cut into small cubes when it was cold, left it in the mixing bowl while I prepared for other ingredients. By the time I started the mixer the butter was already softened slightly (it’s okay to use slightly hard butter in our weather). If the butter you use is very hard then you may want to take it out about 30 mins earlier to let it soften in room temperature. In our warm and humid weather I think I would rather use cooler/harder butter than using butter that is too soft because if the butter is too soft at the beating stage it will yield a very oily cake. 2) This is a pound cake recipe so the sugar amount is suppose to be 150g (same weight as butter, egg and flour) but I have cut down to 105g. You may use up to 150g if you have sweet tooth but I will not recommend using less than 105g. 3) The lemon glaze is enough for two rounds of pouring, use only half of it as you wish. 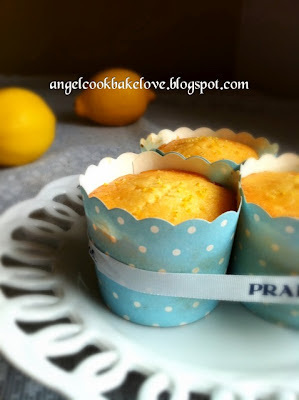 Angel, I love lemon cake too, still have 2 lemons in fridge waiting for me lol. 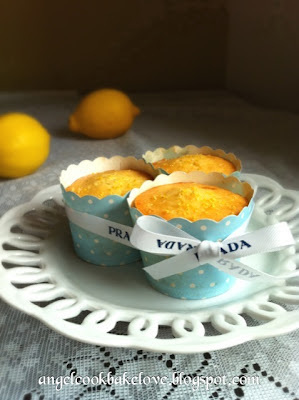 my kids also dont appreciate lemon cake, let me just drool over here..beautiful cupcakes! I like lemon taste and I think I will like this cupcake. Thanks. I think kids don't like too tangy stuff. I must try your famous lemon butter cake one day. Do give it a try and let me know if you like it. Hi Angel, I would like to thank you for all your baking recipes and baking tips. I'm so glad to have found your blog (recommended thr' friends). I've tried some of your recipes already and I found myself falling in love with baking. You have the most comprehensive recipe, both Western and Asian baking. Pls carry on sharing and spread your love for baking. Kudos to you! Hi Angel, thank you for sharing with us your baking recipes. I'm so glad to have found your blog thr recommendation of friends. I've tried a few of your recipes and it actually turned out good enough to eat. Your recipes and baking tips had made baking all the more fun. I love your comprehensive Western and Asian baking. Kudos to you Angel! I am really glab to hear that you fall in love in baking after trying my recipes. You have motivated me to continue blogging about my bakes. Happy baking and keep it up!